Dairy is a global business and the U.S. is one of the three biggest players in the international dairy market. Entering the global arena changes the nature of the U.S. dairy industry. Global events and exchange rates play a big part in the dynamics of the international dairy market. Because these international factors can bring big changes quickly, it has exaggerated volatility in U.S. dairy prices. The U.S. has grown dairy exports quite significantly in the last decade and especially in the last five years. There is no turning back to a U.S. dairy market influenced only by domestic events. Learning how to compete and flourish in this changing market is the challenge for domestic dairy producers and processors. Exports in 2014 began with great upward strength. However, by the end of 2014, the strong USD and other global events made international competition less favorable for the U.S. Overall in 2014, the U.S. grew dairy export volumes by 2% and dairy export values by 6%. Most of this growth occurred in the early part of the year. However, within the individual product categories, there were some major swings. Cheese exports grew by 17%, butterfat decreased by 21%, and whole milk powder grew by 40%. Whole milk powder, which has been a very minor category, is starting to gain significance in the U.S. export market. However, pricing and volume are very volatile. 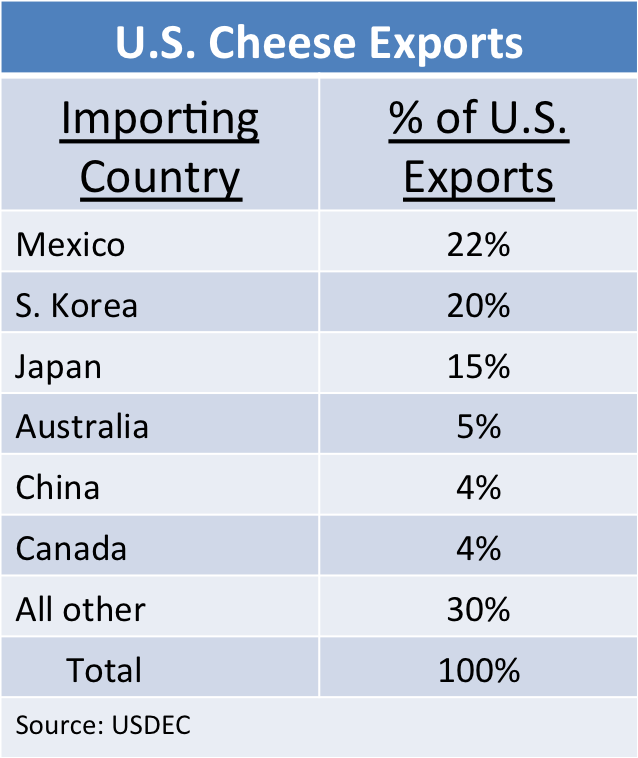 Individual export items that have a strong bearing on U.S. milk prices are discussed individually below. Cheese pricing is extremely important, because it does provide the primary basis for Class III milk prices. (See the April 2009 post to this blog for more detail on this relationship.) 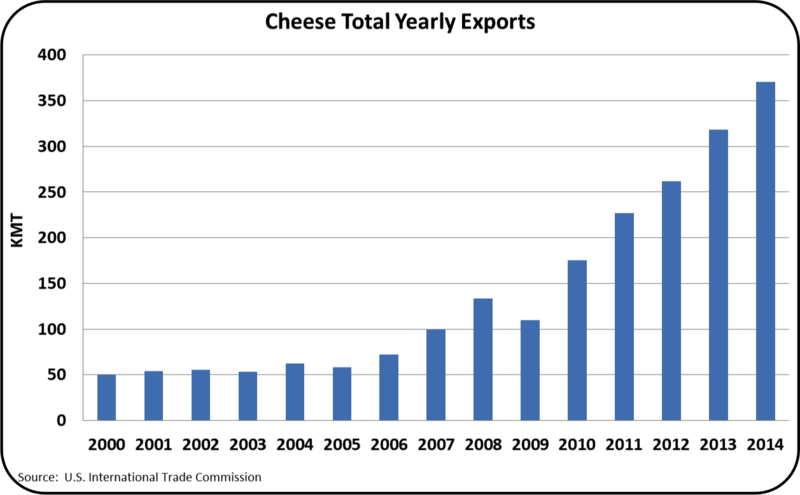 Cheese exports have grown to 7.1% of U.S. cheese production and for the year 2014, amounted to 368,729 MT. Cheese is the second largest export item by dollar value, only slightly behind NDM/SMP, and is the third largest export item by weight. The U.S. is the largest cheese exporter in the world. 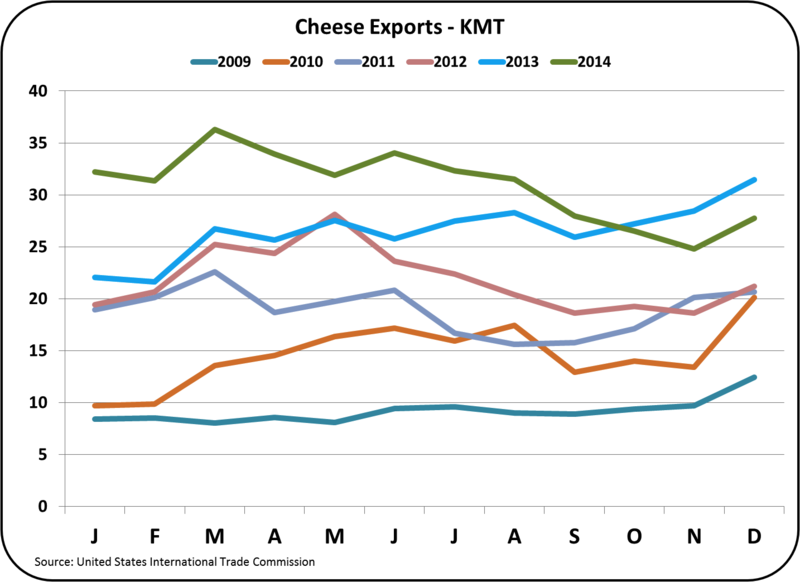 Most of the cheese export growth occurred in early 2014, and in the last quarter, exports fell below the prior year. During this time the USD has strengthened and European dairy processors have had to find a new home for cheese previously shipped to Russia. These factors are weighing on the hedgers and speculators that are active in the CME dairy futures. The current future prices for cheese are around $1.53/lb. vs. the 2014 average of $2.16/lb., and the January 2014 price of $1.58/lb. A further analysis of cheese exports by country show where this cheese is exported. The exports to Mexico are stable and represent U.S. brands that are recognized in Mexico. The sales to South Korea and Japan are growing nicely with 44% and 80% increases in 2014. The lost export sales in 2014 were primarily in some of the Middle East countries. Those sales have dropped to the level where current volumes are so low that additional drops will have little impact. 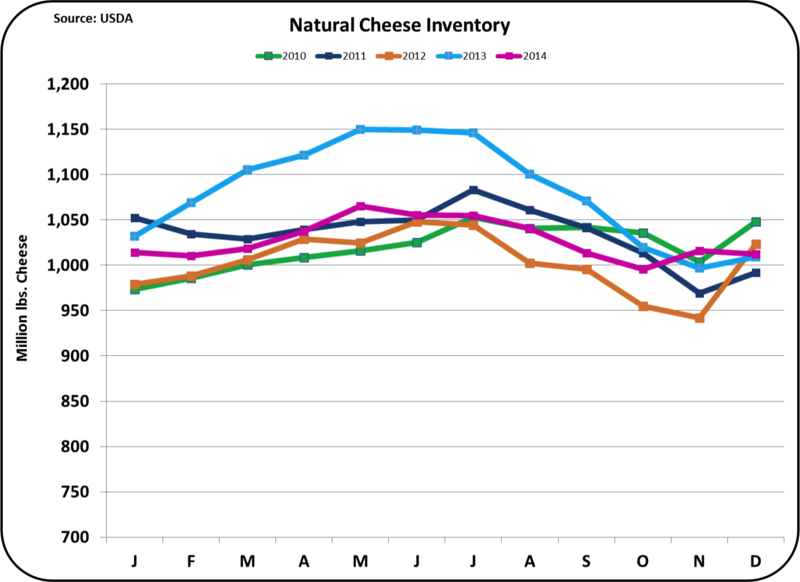 As discussed in the prior post, cheese inventories are not above normal levels even with some contraction in exports. A case could be made that the fears of cheese oversupply are over blown. If sales growth to the largest customers can continue to grow, the important category of cheese exports may not experience a contraction. 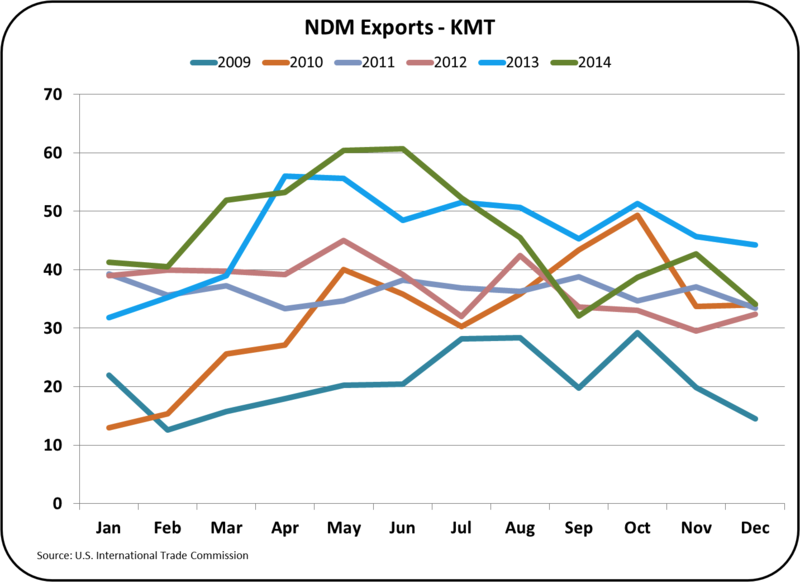 Exports of NDM/SMP grew dramatically in 2013 as the U.S. became the largest exporter for the first time ever. (See the February 2014 post for a review of this.) Volume was down 2% for the year with volumes below 2013 for the last half of the year. Export volumes to Mexico, Central America, and the Caribbean were all up and South America was close to 2013 levels . Exports were down in the Middle east and China as competition heated up and prices fell. Current prices at $1.02/lb. are well below the $2.00/lb. levels of early 2014. Because the majority of NDM/SMP is exported, the domestic price is greatly influenced by the international price. Exports of Whole Milk Powder experienced huge growth in 2014. This is a huge market, but the U.S. has not typically participated in this market. However, in 2014, the U.S. grew this market by 40% became an international player. If NDM/SMP and whole milk powder exports were combined, the U.S. would show an export growth for 2014. While whole milk powder has been and still is a very volatile market, it appears that the U.S. is now pursuing this huge market. 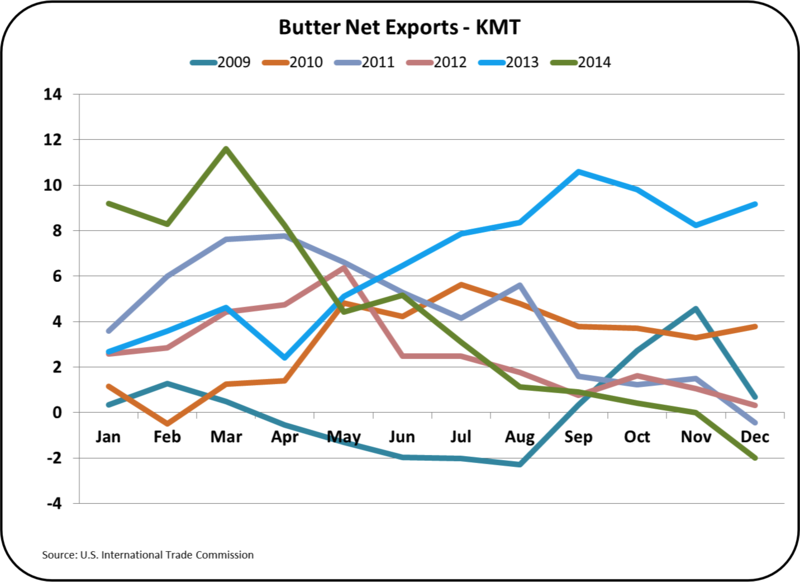 Butter exports have fallen and butter imports have grown. As a result, net exports have taken a huge tumble. At the end of the year, the U.S. was a net importer of butter. This has allowed inventories to recover and prices to fall from the record levels in 2014. Prices are expected to remain relatively high in spite of this turn around in exports and inventories. Exchange rates are driving much of the decrease in export growth in the second half of 2014. 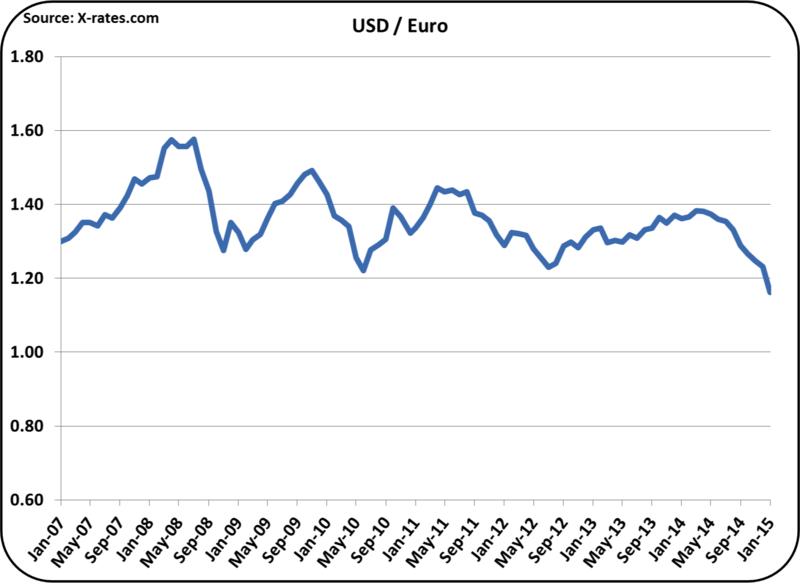 The Euro has fallen to $1.14 currently, a drop of more than 20% from early 2014. This does give the European dairy exporters a significant price advantage in the International markets. The same is true for the New Zealand dollar, but not to the extent of the Euro. 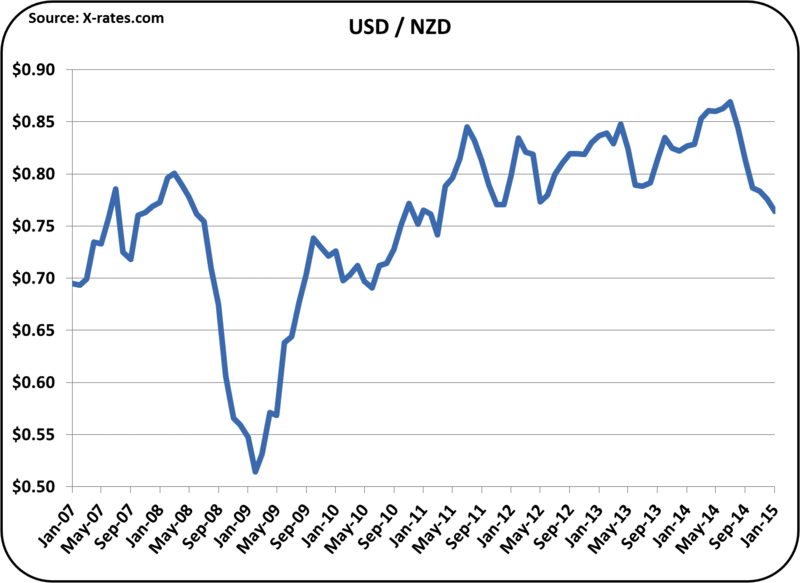 The NZD has dropped in value by nearly 10%, half of the impact of the Euro. Nevertheless, this does hurt U.S. exports. The strength of the U.S. economy does have a dark side, and that is the impact on exports. Exports are having a very big impact on exports and U.S. dairy prices. Exchange rates are now the most influential variable in U.S. dairy prices. Exports will be followed closely in this blog. Dairy Prices Fall - Why is this good? 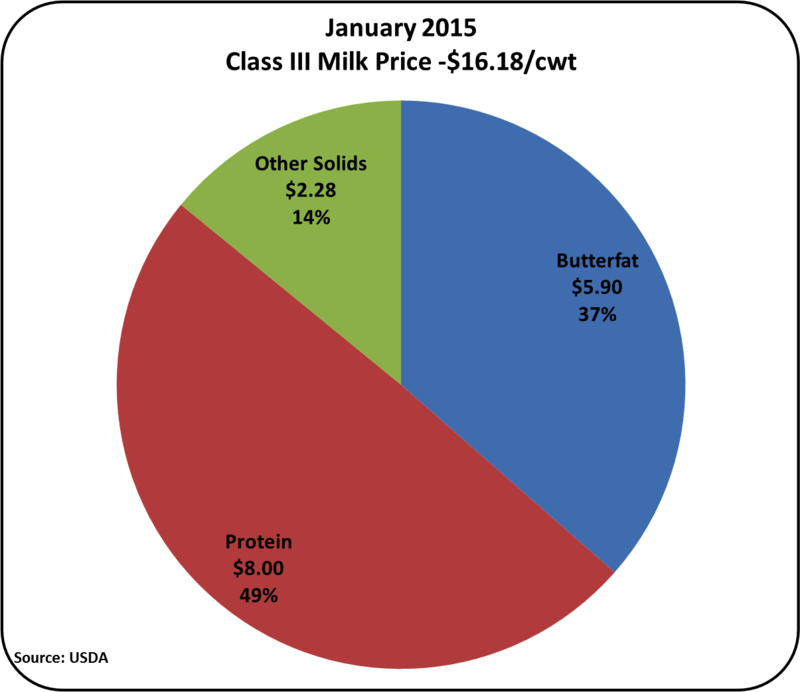 January 2015 Class III Milk and Component Prices were announced on February 4. Most all producer prices were down, with butterfat falling the most of the three components making up the Class III milk price. 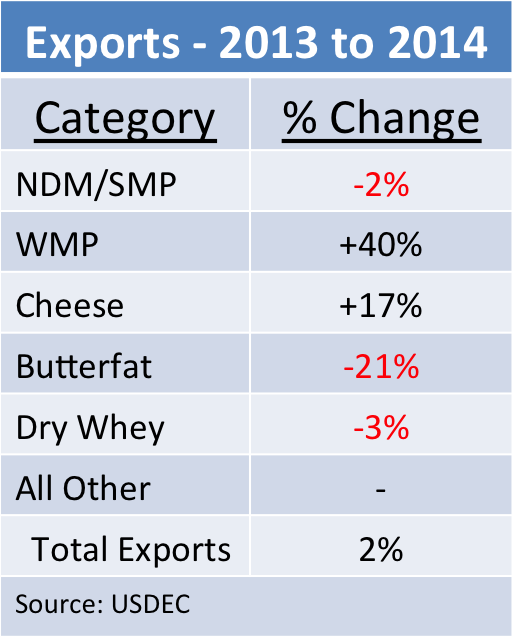 Butter and butterfat have been "overpriced" for most of 2014 and the fall in price to more normal levels was expected. 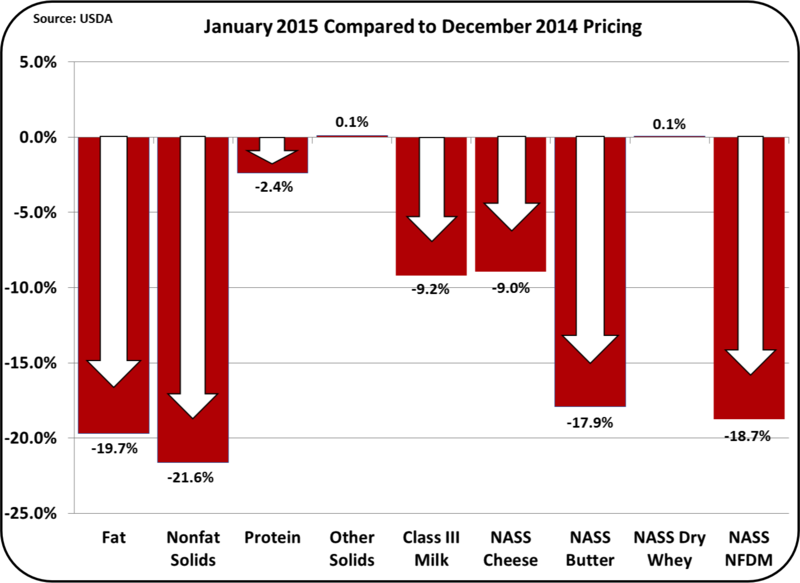 The January NASS price for butter was $1.56/lb., more in line with long-term prices. Cheese prices were down considerably based on an expectation of lower exports due to the strong USD and International dynamics. During 2014, cheese was above $2.00/lb. until December when the price started falling. January's price was $1.56/lb. Recovery is expected as expressed in the futures market, but with prices staying below $2.00/lb. for the rest of 2015. The NASS price of cheese is the main determinant of the Class III milk price. See details on this relationship in the April 23, 2009 post to this blog. As mentioned in this post's title, this price drop, while reducing current producer revenue, is the key to the long-term success of the U.S. dairy market. The U.S. free market capitalist system forces producers to continuously review and reduce costs and look for ways to boost revenue. Inefficient producers are weeded out. Improvements in diets, genetics, and management result in continuous competitiveness. This is what makes for a long-term successful dairy market. Many other international dairy producers in other countries do not have to live with this constant pressure for improvement and as a result, do not improve their processes as quickly or as much as U.S. producers do. This pressure for improvement is the key to making a huge industry increasingly efficient, growing, and profitable. The long-term trends show this month's prices in perspective. 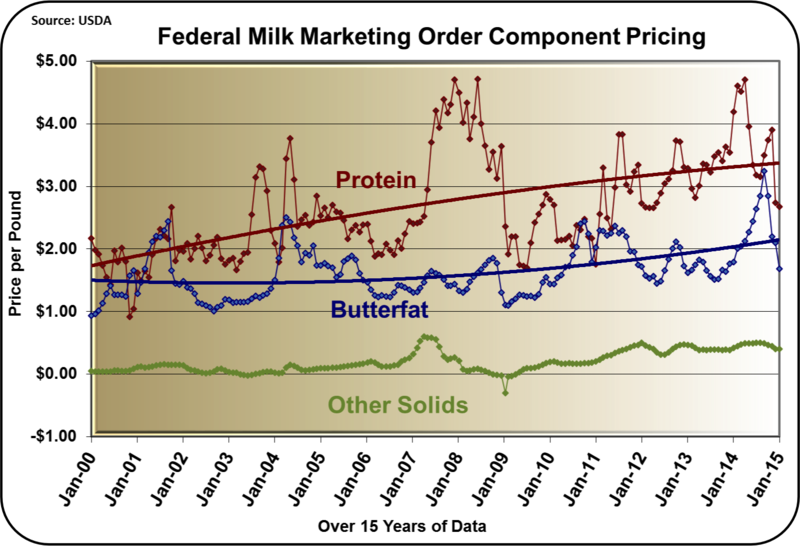 Butterfat and milk protein are below the long-term trend lines. 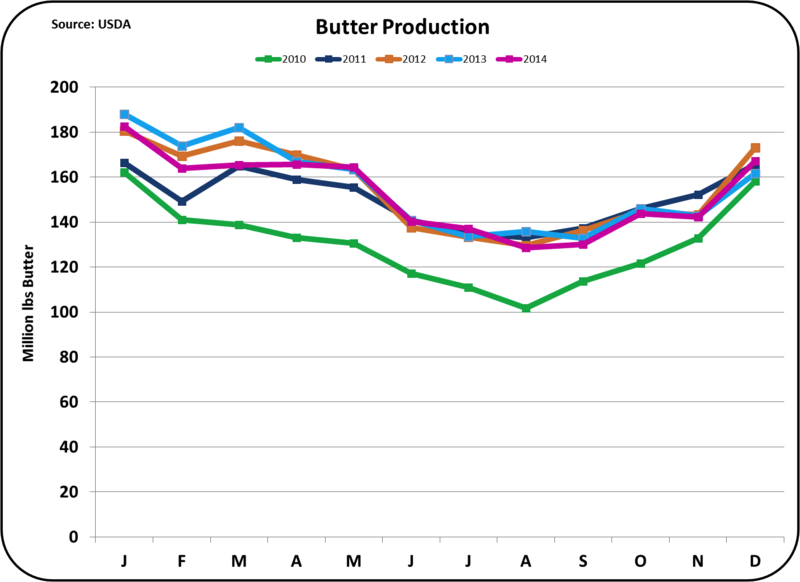 In the case of butterfat, this is because of the record-setting highs of 2014, which were not sustainable. In the case of milk protein, the drop is below the long-term established trend indicating that recovery is likely. The big question is "when." Other Solids pricing, which is based on the price of dry whey, is very stable and consistent with the value that has been established in the last four years. The pie chart of the Class III milk payment is again showing milk protein contributing nearly 50% of the milk payment. Increasing protein levels remains key to improved dairy revenue and profits. Prices go up when inventories are low and down when inventories are too high. Currently, inventories are not too low and they are not too high, as shown in the charts below. 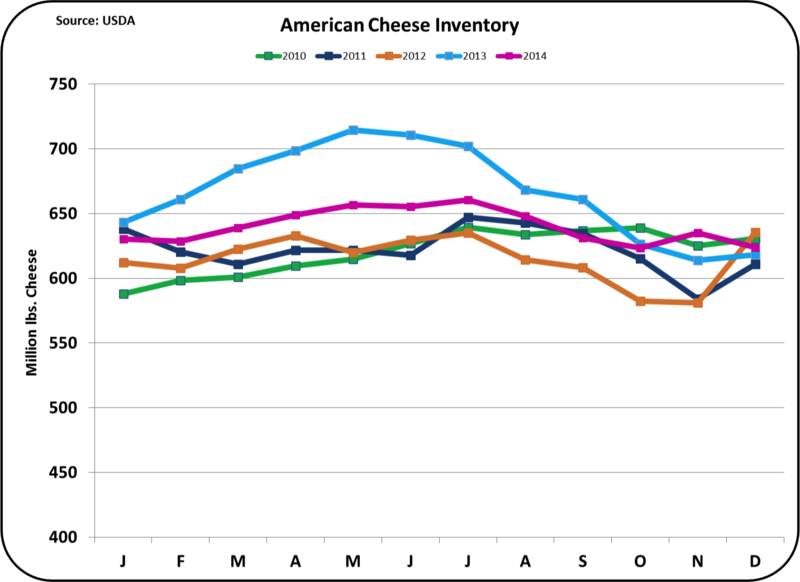 The year-end 2014 inventory levels of natural and American cheese were right in line with prior years. Therefore, the lower prices can only be attributed to an expectation of high inventories caused by reduced exports. The latest export data will be available soon and the information will be posted on this blog. Due to a strengthening of the USD, exports will require lower prices. But, as of year-end 2014, there is no sign of blotted inventories, which would reduce prices. WHAT IS HAPPENING WITH BUTTER? 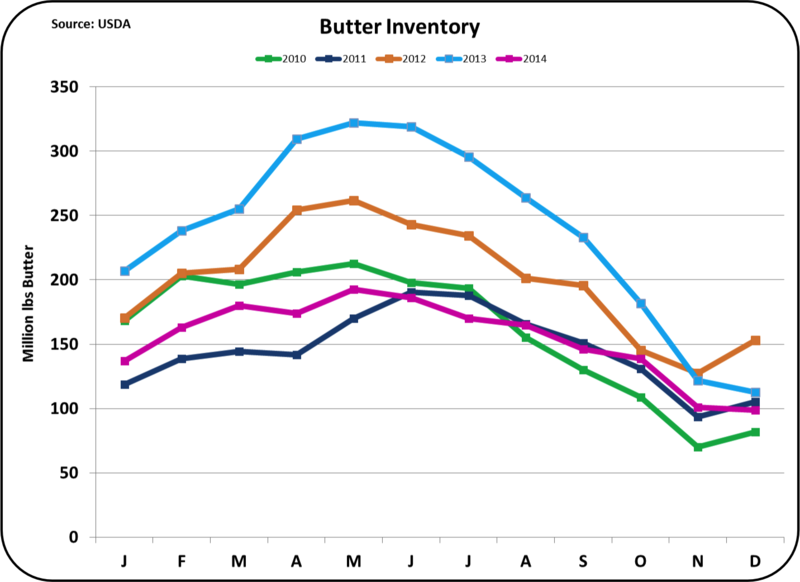 High exports in late 2013 caused butter inventories to drop. They have now somewhat recovered and are close to 2013 year-end levels. For that reason, butter prices dropped returning to more traditional levels. Butter churning did not increase to relieve the low inventories. Inventories recovered only because exports were very significantly reduced. More details on this will be covered in the next post to this blog. Butter was priced at $1.56/lb. in January, and will likely drop a little more in the coming months as butter settles back to historical prices. WHAT IS HAPPENING WITH DRY WHEY? Dry Whey is the basis for "Other Solids" pricing. As more uses of Dry Whey are found, the price has risen from historical values near "0". Dry Whey is primarily an export product and therefore the prices are determined by international events and prices. Unlike other dairy exports, dry whey exports hit a record 58% of production in 2014. This is contributing over $2/lb. to the Class III price. A special analysis of 2014 exports will be made in the next post to this blog. Dairy exports are driving dairy prices.